Hello Everyone! We have some more excellent April Pre-Orders available at Urban Collector. This week we are featuring more Dark Knight Collectibles, as well as new instock Star Wars Titanium Die-Cast vehicles. Below is only a sample of our newest pre-orders. Visit Urban Collector for all of our great collectibles! NEW Star Trek stuff at The Saber Vault! Right now, you can preorder the new Assault Phaser and the new Mark IX Tricorder from Deep Space Nine and Voyager! These are to be shipping late summer, but with accurate sound effects and lights (lights on tricorder only) these will not last long! Plus as an added bonus, if you say you saw this post at the JediTempleArchives.com you get an EXTRA $20 OFF! That means $70 OFF RETAIL with shipping included within the U.S.!!! This week at Brian's Toys, we have a massive amount of high-quality, vintage Star Wars AFA. Some highlights include the prototypes of Ewoks Weechee and Paploo, both graded 90! Also to note are the Tri-Logo Boba Fett and Jawa! The 2008 Collection Wave 2 Carded figures are back in stock. Finally, we have plenty more Legos added to the site, which include the Ultimate Collector's Series Star Destroyer. For more of our great selection of collectible toys, head on over to brianstoys.com. Stop by Sideshow Collectibles to check out the newly approved life-sized C-3PO and R2-D2! Need your Clone Wars fix? Stop by IGN to read a nice little who's who from the upcoming Clone Wars Cartoon. Nothing new, but a fun little read! StarWarsShop.com has the Jedi-Con 2008 Exclusive Shadow Trooper 2-pack in stock. Stop over and place your order! There's still time to get your contest entry in at Sideshow Collectibles for a chance to win a Duel With Dooku Diorma! Click here for all the details! Hello Everyone! We have some terrific new April Pre-Orders available at Urban Collector. From Star Wars we have the newest Gentle Gaint animated maquettes. Here is only a sample of our newest pre-orders. Visit Urban Collector for all of our great collectibles! It's time for another look at the Hasbro Questions &Answers from around the collecting community. You can find all the details over in our forums! And, check back later for our Headlines Report, highlighting all the big news items to come out of this round of Q&A. We just can't get enough of Clones, so how about a Clone Trooper in training? The 30th Anniversary Visual Guide has it, so click the images below to view it! Want to have a look at this years Star Wars Disney goodies? Stop over at EndorExpress.net for some detailed photos of the upcoming Disney/Lucasfilm exclusives! Sideshow Collectibles has also announced a very limited run of a Darth Vader Canvas Giclée, limited to just 95. Click here to have a look at this! This weeks Q&A came with not one, but two very nice images. The first one (V-19 in attack mode) can be seen in this weeks Q&A article, and the second one is a follow-up from our last Q&A: a detailed photo of the upcoming SDCC exclusive Holographic Emperor head and Darth Vader! Click below for the detailed image! Hasbro hits us a day early this time with another Hasbro Q&A! This time, we've got a nice image of the V-19 Torrent in attack position! If you are a fan of Force FX Lightsabers, make sure you stop Saber-Stand.com and check out their display solution. These vertically mounted stands help protect your saber from the long-term effect of warping when displaying them sideways on their stock stands, and they look very elegant at the same time. Saber-Stand.com: protect your investment! Stop by our forums for our in-depth look at this past weeks Hasbro Q&A from around the collecting community. And new this week, a special Headlines Report, featuring the biggest news to come from all the communities questions, saving you the energy of sifting through the dozens of questions for what's newsworthy! Sandtroopers.com wants to spread the word about their Make It Better campaign they are running this year. To kick things off, they have put up the Clone Wars and Indiana Jones lithographs from Toy Fair up for benefit for the Make-A-Wish Foundation and the American Society for the Prevention of Cruelty to Animals. To enter it's a simple $3 Paypal donation, and to be a registered member of their community. For more details, click here! Another clone trooper joins the 30th Anniversary Visual Guide! This time, it's the Expanded Universe Clone Wars clone trooper from Hawkbat Battalion! It looks like we will have to wait another year for the live action series. As of now, it is pushed back to 2010. Lucas dished some information at the ShoWest Convention on both the live action series and the upcoming Clone Wars series. Get all the scoop here! New items at Urban Collector! This week we have more featured March pre-orders as well as some cool new arrivals. Here is just a sample of the items available for pre-order and instock at UC. Stop on by to see our entire selection. The 7th Legion Clone Trooper joins the 30th Anniversary Visual Guide! Click below for both the figure & the coin guides! This weeks Newsletter from Brian's Toys features the latest and hottest items from Gentle Giant, including the 2008 Holiday Gift. Along with that, the Attack on Kashyyyk Battle pack from the 30th Anniversary Collection is also available. Check out all the great deals here! The folks over at Kotobukiya wanted us to let everyone know that they will be attending Wizard World L.A on March 15th, where they will be holding a panel to discuss their upcoming Marvel line, as well as take questions on everything else they make. Get the full details here! Hi - Here is a quick update from http://www.bigbadtoystore.com about hundreds of new arrivals and preorders! Sideshow has released the latest Star Wars Diorama in this weeks newsletter: Padmé Vs. Nexu. Click here for the sneak preview! Stop by The Saber Vault and check out the Weathered 212th Master Replicas helmet! This has custom Weathered/Battle Damaged finish with battalion stripe as seen on film. The Weathering is done using production stills by the model builder/prop maker. There's only one left, so if you are still thinking about this one, don't think too long! Also, still in stock are the last two FX lightsabers! 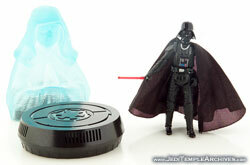 Vader and Yoda priced at $85...so something to spend some of that tax refund on! Hasbro has finally released our pre-Toy Fair questions, but fear not! All of these answers are as good as gold, including complete details on the upcoming SDCC Holographic Emperor! It's all right here in JTA's Hasbro Q&A! Tonight we give you a small 30th Anniversary Visual Guide update with R2-D2 and the cargo net. Click below for all of the guides! MR Utapau Shadow Trooper Mini Helmet Available Today! The final details for the last Master Replicas Mini Helmet exclusive are now available. These will be available in an ebay auction at 2PM EST, and limited to 2 per person. For the full press release, click here! Stop by Brian's Toys latest newsletter for the latest Saga Legends wave, featuring the Utapau Shadow Trooper and the Shadow Stormtrooper, both with the unique black coin. Also available is a cheap Yoda Force FX Lightsaber ($79.99), The Force Unleashed wave, 30th Anniversary vehicles, and more! We got word from the Hasbro Q&A team that this round of questions and answers are going to be slightly delayed. They also let us know that our last round of questions got missed and should arrive as well. Tune in next week for our next Hasbro Q&A! Full details on how to aquire the Obi-Wan Kenobi in Clone Trooper Armor Mini Bust are now available. Click here for all the information! Click below to check out our latest Visual Guide, the latest exclusive from Gentle Giant: The Exhibition (Brussles) Holographic Darth Maul. Complete with light-up effect! GentleGiantCollectors.com has a Q&A with Amanda from Gentle Giant with answers to some burning questions, not only from Star Wars, but from other lines as well. Click here for the full Q&A. The latest update from Urban Collector contains new March Pre-Orders, some great new arrivals and a look back at some classic collector's items. Sideshow has Clones on the way, and likely lots of them! Which ones? Help them decide which one is guaranteed by participating in their new "Pick your favorite Clone Trooper armor style!" poll! Choose from a variety of Episode III clones: 501st, Shock Trooper, 212th (orange), 187th (purple), 9th Assault Corps (gray), and 38th armored (tan). My guess is it will be a tight race between the 501st and the Shock Trooper! Head over and vote! Still looking for the Darth Maul Holographic exclusive? Public ordering is now available at Gentle Giant's Web site! There's still some available, but with a limited run of 1000 online, they probably won't last long! Looking for a way to safely (and elegantly) display your Force FX Lightsabers? Check out Saber-Stand.com. These stands allow you to vertically display your sabers to keep them from warping over time, and this frees up room on your wall for all your other collectibles! Check it out today! We've heard all about the bonus Darth Vader, now have a close-up look at this super-cool bonus build-a-figure in this edition of our Kotobukiya Spotlight! Brian's Toys has the latest figures from the 2008 Collection, including the Force Unleashed. Also, stop by their coin shop because they have quite a few vintage coins in stock and ready to ship! For a great selection of Vintage, POTF2, LEGO, and even posters, stop by www.briantoys.com.